I’ve been a renter for the last 18 years in the same small house. I don’t bother my landlord with much, but recently I could no longer ignore the decrepitude of my refrigerator. It was time to ask for a new fridge. The cubic footage of the new unit was the same as the old one, but it was a top freezer model, not a side by side like the one it replaced. No matter – it was shiny and new. I was happy until I started putting things away. The top freezer was significantly smaller than the side by side it replaced. I noticed that although there were holes for a shelf, the shelf wasn’t included. I piled as much in as I could, then called the appliance store. Turns out the holes were for a shelf that comes with the next model up. I could buy the coated wire shelf separately, but it would cost over $100! No thanks. What’s an organizer to do? Measure the interior dimensions of the freezer, of course, and go shopping for storage options. A combination of coated wire shelving, specialized plastic refrigerator bins and my trusty 6-gallon plastic shoeboxes maximized the space. I polished off the job with my labeller. 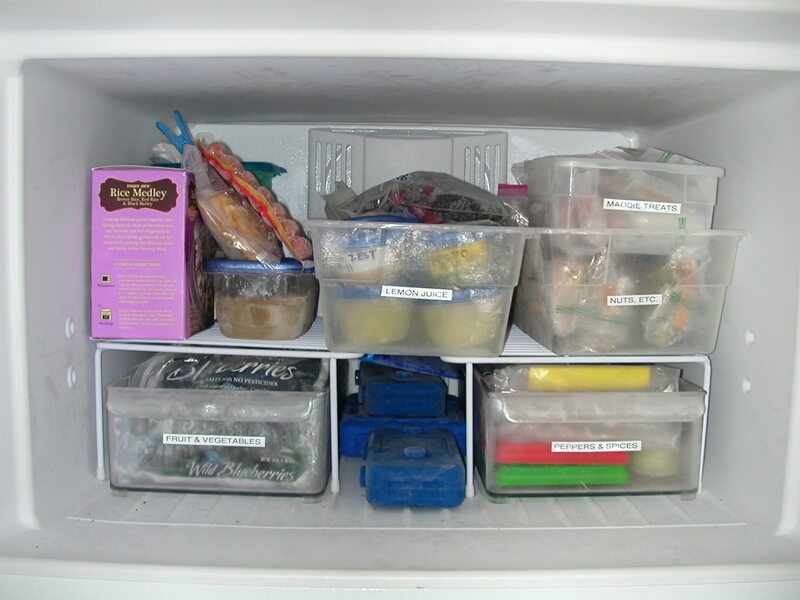 The organized freezer. I have a very productive lemon tree and Maddie is my dog. It still holds less than the previous freezer, but I can find what I want without digging through a jumbled mess. Nice idea! I also love ziploc bags and good sharpie! I eat Rice Medley, too! How’s the pooch?